Paroled juvenile lifer Kempis “Ghani” Songster was released from Graterford State Prison Thursday morning. He holds up his arms as he acknowledges the words of friends and relatives at a reception at Calvary Center for Culture and Community on Dec. 28, 2017. "This is where it starts." "Keep up the fight," she called to him. Walker was one of several prison officers who made it a point to say goodbye to Songster, 45, one of the highest profile of the lifers, including one who told him on his way out, "You're a good person." 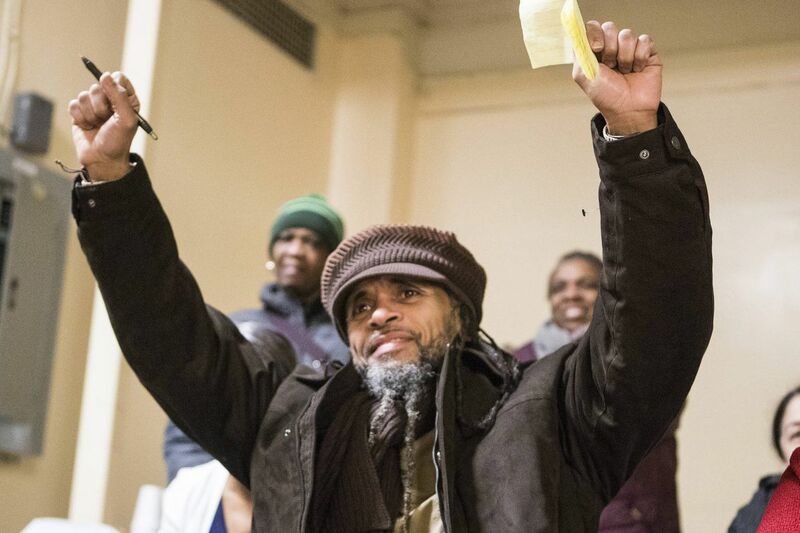 Songster's nearly 30-year journey from convicted teen killer, sentenced in 1988 to life without parole, to freed middle-aged adult walking out of prison in 2017 touched more than the 27 teary relatives who traveled from New York and North Carolina, and a half-dozen other supporters who made the frigid sunrise trip to the Montgomery County prison. "This is inspiring for the other inmates," Walker said. Around 8:20 a.m., Songster walked out of the green garage doors next to the visitor area with several other inmates, carrying a box and a bag, a smile quickly crossing his face. His relatives, waiting inside the visitor area, poured out into the arctic air to greet him. "Yes." he said as he waded through his relatives, raising his arms, hugging, and squeezing in a quick FaceTime greeting placed in front of him. "I didn't sleep," he added a few minutes later. Kempis “Ghani” Songster, right, is hugged by Malik Bandy at a reception at Calvary Center for Culture and Community on Dec. 28, 2017. The two were once incarcerated together. Songster greeted his mother, Catherine "Joy" Songster, who described herself as "elated", and his aunt Gail Songster, who made many a trip from Brooklyn to Philadelphia on his behalf. Also waiting was Mike Lyons, a professor at St. Joseph's University, who collaborated with Songster to create "The Redemption Project" website and advocacy group, and who brought more than 100 of his students to visit with Songster and other juvenile lifers. Sean Damon of the West Philadelphia-based Amistad Law Project also made the trip, as did Anne Swoyer, a volunteer in the prison who, like many who encountered him, including Villanova University professors and advocates, befriended the gregarious inmate they call "Ghani" and waited for this moment. "I can't even describe it," Songster said as he walked away from the prison toward the parking lot, which he said was literally the farthest in one direction he'd been able to walk in three decades. "I'm a mixed bag right now. I'm trying to make sure this is actually — I'm walking in one direction for this long. Usually I'm having to turn a circle by now. you know, but I'm still walking straight." Songster is one of about 200 Pennsylvania lifers who have been re-sentenced from life-without-parole sentences that the U.S. Supreme Court found unconstitutional nearly two years ago. Nearly 100 have been released. Pennsylvania had about 515 juvenile lifers who became eligible for new sentences under the rulings. A judge in July resentenced Songster to 30 years to life. His co-defendant, Dameon Brome, is in prison in Dallas, Pa., awaiting a decision from the parole board. Kempis “Ghani” Songster, right, is lifted off the ground by Yusef Jones as he arrives at a reception at Calvary Center for Culture and Community on Dec. 28, 2017. The two runaways from Brooklyn were convicted of killing a third runaway, Anjo Pryce, 17, in a dispute inside a fortified crack house in Southwest Philadelphia run by the Jamaican drug gang all three worked for. They turned down a plea deal that would have freed them a decade ago. For the day, Songster was headed to his fiancee's house in Lawncrest, then later to West Philadelphia for a reception at the Calvary Center for Culture and Commun ity, organized by Lyons. He, Lyons, and another paroled juvenile lifer, John Pace, have several speaking engagements planned for early 2018, and Songster hopes to continue advocating for juvenile and other lifers. A vegan yoga and fitness instructor, Songster has a job waiting at a gym in Spring Garden. Kempis “Ghani” Songster, right, kisses his fiancee, Monay Washington, at a reception at Calvary Center for Culture and Community on Dec. 28, 2017.